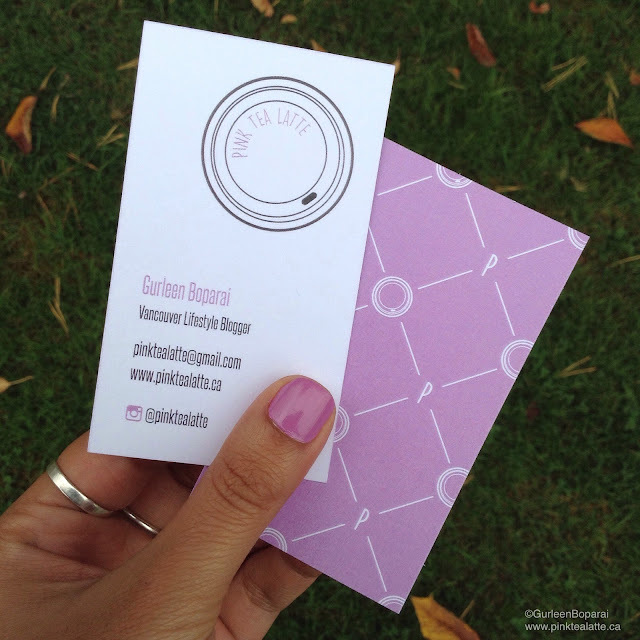 Pink Tea Latte: Working Gurl | My First Set of Business Cards! My first set of business cards! Designed by me! Digitally rendered and printed by Made In Print! If you have not noticed already, exciting changes have been happening on my blog - well specifically I have a new logo! I am so excited to share with you my experience of designing, working with Made in Print, and my final business cards! I did not realize that being a blogger was more then just posting online and sharing cool things on my social media. Practically without a fail, every business or person I spoke to about my blog asked me for my business card?!? At first, I thought they were all just joking and giving me a hard time since I am still a new blogger; however, after asking them why, it became apparent that they expected me to have my own business cards. Most bloggers in Vancouver all have business cards with their blog information on it. The notion of a blogger having a business card seemed a bit absurd to me. I have always associated business cards with a "business" to give out to potential clients. However, business cards have now evolved to a marketing tool. One of my favourite examples would be Bando's business cards. Their business card is no longer a white card stock with the company name in one corner and the employees name and information in the bottom right corner. 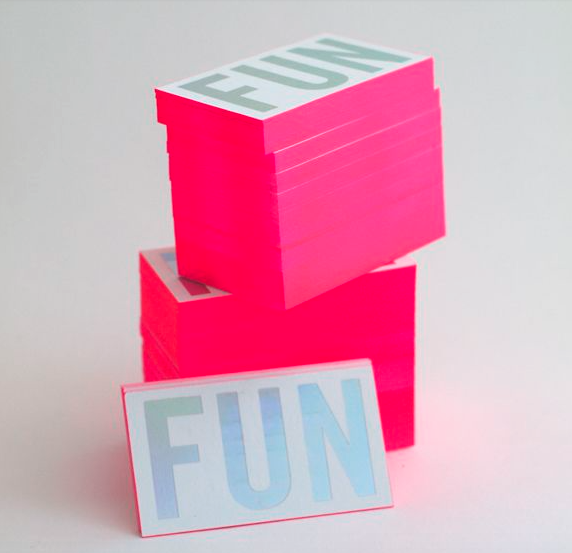 It is an eye-catching piece of art that embodies their fun outgoing company that is passionate about having fun! I wanted to design my own card and not have anyone telling me how my card should look. The card needed to be a reflection of my blog with is ultimately a reflection of ME! Prior to even going in to talk to printing companies, I spent several weeks sketching designs, looking at designs online for inspiration and figuring out how I wanted my business cards to look. Once I knew the direction I wanted my business cards to go in, it was time for me to find someone to print them! It was important to me that I meet the company in person and have a consultation as I did not have the time to graphically render my cards myself. Plus, just like clothes, when you order online, you do not know what you are going to get. This was also a great opportunity to support another Local Company! I had walked by Made in Print's Broadway location many times, so they were the first I checked out. With the fabulous customer service that they gave me, I did not even think to check out another printing company. Not to mention how impatient and eager I was to get my cards printed and in hand! They were super sweet, I sketched out my design for them and Lily, from Made In Print, gave me some really great pointers on how I can improve my logo and design. She also showed me all the different options I have for type of paper, type of print, style etc. It was nice to see the examples in person and feel the paper. That is something you cannot do online! After that, I just went home, re-sketched it and emailed the design to them. Probably within 24hrs, Made In Print sent me two digital proofs to pick from. We probably went back and forth a couple of times before I was happy with the design. From there, they printed out four colour proofs for me. I had to go into the office and select the colour I liked best since colour on our computer screens does not necessarily print out in the exact same shade. With their speedy service, I had my business cards in hand in two business days! Overall, the whole process of having my business cards digitally designed, proofed, and printed took a week. I would say that is pretty darn amazing because I am a hard person to please! I definitely recommend checking out Made In Print for your first set of business cards. Not to mention, Students get a discount ;) They are really great with being informative and have really talented graphic designers to make your vision come true! I will be doing a second post on how I came up with the design, what changes I made and some really helpful tips by Lily from Made in Print on branding. Let me know if you are thinking of getting business cards?